Paul Finley Zaloom is an American actor and puppeteer best known for his role as the character Beakman on the television show Beakman's World. In 1992 Zaloom starred in the cable TV children's science program Beakman's World. The show moved to CBS in 1993 and aired for four seasons. Zaloom has also written, designed and performed eleven full length one-man shows, including Fruit of Zaloom, Sick But True, Mighty Nice, and The Mother of All Enemies, the latter a shadow-puppet show featuring traditional Middle-Eastern comic puppet character Karagoz. His latest effort tackles social issues such as privacy, the war on terrorism, and discrimination based on sexual orientation and ethnicity. Aside from shadow puppetry, Zaloom's idiosyncratic work utilizes techniques such as overhead projection, government document expose, cantastoria picture performance, toy theater, as well as hand, rod, found object, and dummy puppets. Paul Zaloom has produced two films; the first is a mockumentary entitled In Smog and Thunder: The Great War of the Californias, recounting a fictional war between Los Angeles and San Francisco, released in 2003. The second film, Dante's Inferno, is a retelling of the poet Dante's journey through hell, set in Los Angeles and performed in a style of puppetry called toy theater that uses paper cutouts for puppets and sets. Zaloom co-wrote the script and was head puppeteer and performed multiple voices for the film. Both films feature the artwork of Sandow Birk. Zaloom has performed his work across the U.S. at many types of venues, including the Kennedy Center, Lincoln Center, the Walker Arts Center, Spoleto Festival USA, UCLA Performing Arts Series, the American Repertory Theater, L.A.'s Museum of Contemporary Art, King Tut's Wah-Wah Hut, and hundreds of others. He’s also played the Edinburgh Festival Fringe, Les Semaines de la Marionette in Paris, the UNIMA World Congress in Dresden, Vienna Festival and many others on 9 international tours. Zaloom has received a Village Voice Obie Award, an American Theater Wing Design Award, New York Dance and Performance Award (the “Bessie”), LA Weekly Theater Award, and 4 Citations of Excellence in the Art of Puppetry from UNIMA-USA. He’s also been granted a Guggenheim Fellowship, four Jim Henson Foundation grants, a COLA Fellowship, four National Endowment for the Arts grants, to name a few. He has taught puppetry and cantastoria at colleges and universities in the US and Europe, including Cal Arts, Rhode Island School of Design, Emerson College, the Omega Institute, George Mason University, the University of Michigan, and the Institut Internationale de la Marrionnette, Charlesville, France, amongst others. 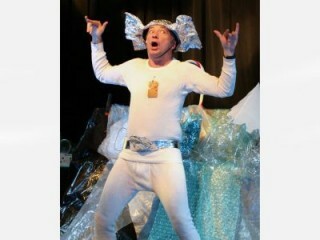 He continues to perform as Beakman in Beakman Live! stage shows, and is involved in any number of artistic projects as an advisor and mentor. * Puppeteer, many different productions with the Bread and Puppet Theatre,Glover, VT, 1971. * Puppeteer, The Revenge of the Law, and Harvey McLeod, withthe Bread and Puppet Theatre at the New York Shakespeare Festival, Public Theatre, 1972. * Created one-man shows; The Fruit of Zaloom, Performing Garage, NY,1979, Zalooming Along, Performing Garage, NY, 1980, Zaloominations, Theatre for the New City, NY, 1981, Crazy as Zaloom, Theatre forthe New City, 1982, Creature from the Blue Zaloom, Inroads Theatre Company, NY, 1984. * Has toured all of his one-man shows throughout the U.S.
View the full website biography of Paul Zaloom.